Thousands gathered at a rally in commemoration of the murdered opposition figure Boris Nemtsov in the Russian capital. Demonstrators have marched through the center of Moscow, crossing over the bridge near the Kremlin where the politician was shot dead. At the beginning of the rally, Moscow police said around 16,500 people were taking part. After it ended at about 5 pm local time, police said that according to their estimates at least 21,000 people attended the event. Opposition member Sergey Davidis said nearly 50,000 people participated in the march, RIA Novosti reported. 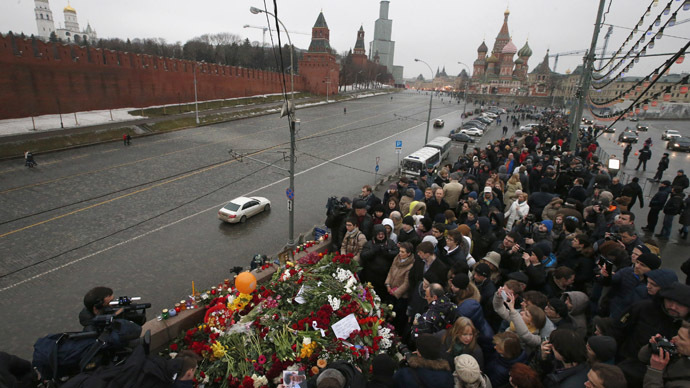 Many were carrying flags, flowers and copies of Nemtsov’s portrait. The mourners visited the site of Nemstov’s murder, which has been cordoned off by police. Even though the march was in memory of the slain opposition figure, there were several people who carried posters with calls urging the authorities to free Ukrainian pilot Nadezhda Savchenko, including her lawyer. She had been detained by Moscow on charges of connection to Russian journalists’ murders in Donbass. Police also prevented about a dozen nationalists, some wearing masks, carrying black-yellow-and-white flags, from participating in the march. In St Petersburg at least 6,000 people gathered for a commemoration rally at Marsovo Polye, local police said. Mourning events were also held in other Russian cities, including Kazan, Nizhny Novgorod, Perm, Orenburg, Tomsk and Khabarovsk. The mourning march is instead of the Vesna (Spring) opposition rally, that had been planned for Sunday, but was canceled due to Nemtsov’s death. The slain politician was one of the organizers of the rally and called on people to come join it in an interview given just hours before he was shot. Thousands of people have laid flowers at the scene of the murder. Boris Nemtsov was shot several times just before midnight Friday, while he walked across the Bolshoy Moskvoretsky Bridge leading from the Red Square, allegedly in the company of a Ukrainian model, Anna Duritskaya. It was first reported that the fatal shots were fired from a passing-by vehicle. Later a CCTV footage of the incident emerged, which suggests that a killer could have been waiting for Nemtsov on the bridge and then escaped on a car parked nearby. The footage is a low-resolution one and only allows to distinguish the cars on the bridge and the figures of people moving along it. Investigators are currently looking into five possible motives behind the assassination, according to Vladimir Markin, spokesman for the Investigative Committee. The politician’s murder could have been a provocation to destabilize the political situation in Russia, Markin said. It could have also been linked to the threats Nemtsov received over his stance on Charlie Hebdo shootings in Paris or the current civil war in the east of Ukraine. The politician’s business activities and a possible assault related to his personal life are also being looked into. Nemtsov, 55, came into the spotlight as governor of Nizhny Novgorod region from 1991-97. He also served as energy minister and deputy prime minister under former President Boris Yeltsin. After 1998 he participated in the creation of several liberal movements and parties, serving as a member of parliament. Since 2012, he co-chaired the liberal party RPR-PARNAS (Republican Party of Russia – People's Freedom Party). He ran for mayor of Sochi in 2013, but lost the race with only 13.6 percent of the popular vote. The same year, he was elected a member of the Yaroslavl Region parliament.